They are covered in the finest garms and the beauty of the outfits are only shown off further when the choir begin moving in harmony and routine. 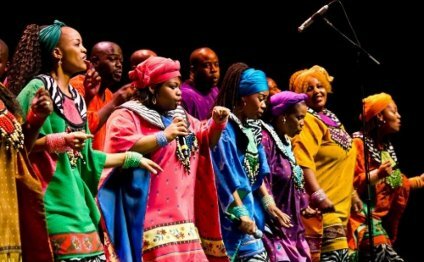 Most choirs remain stationary apart from the main singer and that's if you are lucky but with the Soweto gospel choir they are on stage and come to life! Having different routines for each song, you can't help get into the music as they move their bodies around with ease and rhythm! When they performed their song 'Ahuna Ye Tswanang Le Jesu Kammatla' the audience just could not contain themselves and actually got up out of their seats and began to dance along with the choir! They put so much life and energy into their performance that it's hard not to get involved yourself and simply have a good time! They even spoke to the audience as they were trying to catch their breath, they really do deserve all the love they receive because they give it back to their fans tenfold!